Following the announcement of exclusive negotiations with Boehringer Ingelheim and as per the IFRS 5 presentation requirement for discontinued operations, net income for Sanofi's Animal Health business (Merial) was reported on a separate line (“Net income from the held for exchange Animal Health Business”) in the Consolidated Income Statement for 2016 and the prior year. In the first three quarters of 2016, Sanofi comments included Merial for every income statement line using the term “Aggregate”. Sanofi neither presents “Aggregate” figures nor reports Animal Health business as an operating segment in Q4 2016 and in 2016 as a result of the closing early in 2017 of the swap of the Animal Health/CHC business with Boehringer Ingelheim. 2016 net sales including Animal Health were €36,529 million of which €9,466 million in the fourth quarter of 2016. Net sales were €8,867 million, up 3.3% on a reported basis (up 3.4% at CER). Sanofi Genzyme (Specialty Care) GBU increased 12.6% driven by multiple sclerosis products. 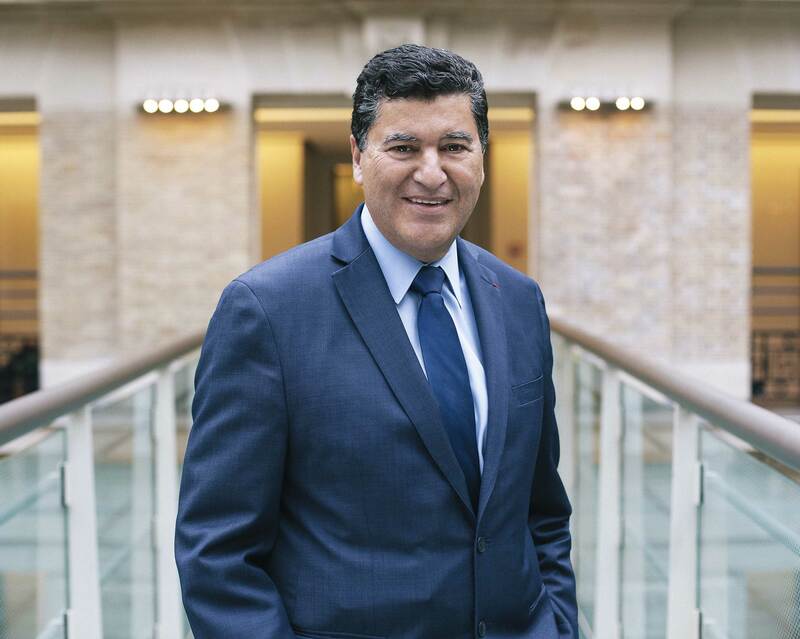 Sanofi Pasteur GBU grew 3.7% due to strong pediatric combination franchise sales. Diabetes and Cardiovascular GBU sales were up 3.8%. Global diabetes franchise sales increased 1.9%. Net sales in 2016 were €33,821 million, down 0.7% on a reported basis and up 1.2% at CER. Sanofi Genzyme GBU sales reached €5,019 million, up 17.3% while Sanofi Pasteur sales grew 8.8% to €4,577 million. Emerging Markets sales increased 2.4% to €9,593 million (up 7.0% excluding Venezuela). 2016 Business EPS of €5.68 (+4.1% at CER) and IFRS EPS of €3.66 (+11.6% on a reported basis). Q4 2016 Business EPS was €1.25, down -1.5% at CER impacted by an unfavorable tax rate comparison. Board proposes dividend of €2.96, the 23rd consecutive annual increase. 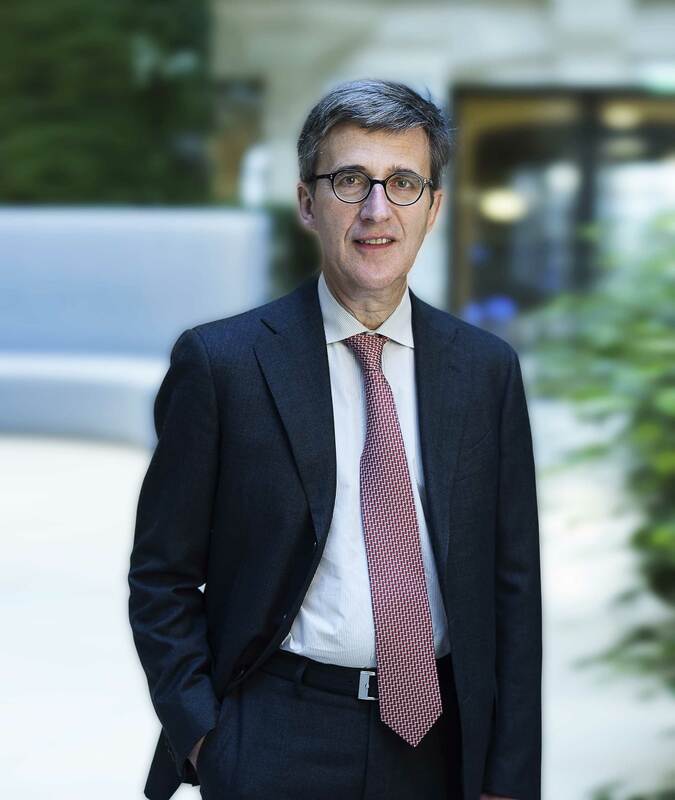 Closing of the Boehringer Ingelheim (BI) business swap elevates Sanofi into a global leadership position in CHC. 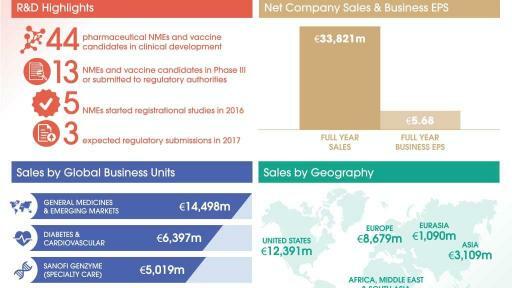 Sanofi Pasteur and MSD end joint vaccines business to pursue their European vaccine strategies independently. Soliqua™ 100/33 launched in the U.S. and Suliqua™ approved in EU for type-2 diabetic patients. Kevzara™ (sarilumab) in rheumatoid arthritis approved in Canada and U.S. resubmission planned in Q1 2017. 5 NMEs started registrational studies in 2016: isatuximab, PD-1, sotagliflozin, olipudase alfa and NeoGAA. 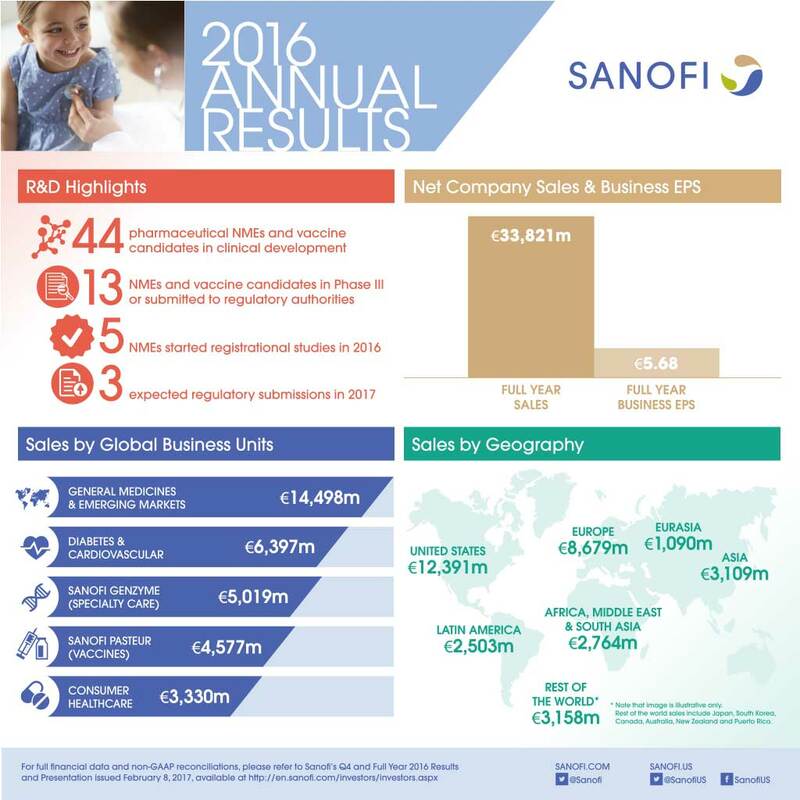 Sanofi expects 2017 Business EPS to be stable to -3% at constant exchange rates, barring unforeseen major adverse events, consistent with its previously announced Strategic Roadmap guidance for the 2016-17 period. Applying the average December 2016 exchange rates, the currency impact on 2017 Business EPS is estimated to be +3% to +4%. In January 2017, Kevzara™ (sarilumab) was approved in Canada for the treatment of moderate to severe rheumatoid arthritis in adults. On October 28, 2016, the U.S. Food and Drug Administration (FDA) issued a Complete Response Letter (CRL) regarding the Biologics License Applications (BLA) for sarilumab for the treatment of adult patients with moderately to severely active rheumatoid arthritis. The CRL refers to certain deficiencies identified during a routine good manufacturing practice inspection of the Sanofi Le Trait facility where sarilumab is filled and finished, one of the last steps in the manufacturing process. Satisfactory resolution of these deficiencies is required before the BLA can be approved. Based on review of Sanofi’s responses to the FDA 483 letters as well as proposed corrective actions, the FDA has classified the Le Trait ‘fill and finish’ facility as “acceptable”. Sanofi plans the re-submission of sarilumab U.S. BLA in the first quarter of 2017 subject to successful FDA pre-approval inspection of Le Trait. In December 2016, the European Medicines Agency accepted for review the Marketing Authorization Application for Dupixent® (dupilumab) for the treatment of adults with moderate-to-severe atopic dermatitis (AD) who are candidates for systemic therapy. In November 2016, the FDA approved once-daily Soliqua™ 100/33 (insulin glargine 100 Units/mL & lixisenatide 33 mcg/mL injection) for the treatment of adults with type 2 diabetes inadequately controlled on basal insulin (less than 60 Units daily) or lixisenatide. 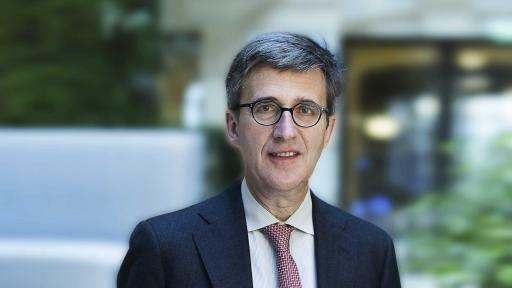 In January 2017, the European Commission also approved Suliqua™ in combination with metformin for the treatment of adults with type 2 diabetes to improve glycemic control when this has not been provided by metformin alone or metformin combined with another oral glucose lowering medicinal product or with basal insulin. At the beginning of February 2017, the R&D pipeline contained 44 pharmaceutical new molecular entities (excluding Life Cycle Management) and vaccine candidates in clinical development of which 13 are in Phase 3 or have been submitted to the regulatory authorities for approval. Sotagliflozin, an oral SGLT-1&2 inhibitor, entered into Phase 3 in type 2 diabetes. The Phase 3 program evaluating dupilumab, an anti-IL4Rα monoclonal antibody, in nasal polyposis was initiated. GZ402666 (also referred as neoGAA) entered into Phase 3 for the treatment of Pompe Disease. Isatuximab, an anti-CD38 naked monoclonal antibody, entered Phase 3 development for the treatment of relapsed refractory multiple myeloma. In November, Sanofi and Regeneron announced that the ongoing Praluent® ODYSSEY OUTCOMES trial will continue as planned, based on the recommendation of an independent Data Monitoring Committee (DMC) after a second pre-specified interim analysis was conducted. In November, the results of SARIL-RA-MONARCH, a Phase 3 study, demonstrated the superiority of investigational sarilumab monotherapy versus adalimumab (marketed by AbbVie as Humira®) monotherapy in improving the clinical signs and symptoms in adults with active rheumatoid arthritis. The data were presented at the American College of Rheumatology 2016 Annual Meeting. Top-line results had been announced in March 2016. SAR439152, a myosin inhibitor, moved into Phase 2 for the treatment of Hypertrophic cardiomyopathy. SAR425899, a GLP-1 / GCGR agonist, entered into Phase 2 in type 2 diabetes. SAR566658, a maytansin-loaded anti-CA6 monoclonal antibody, moved into Phase 2 for the treatment of solid tumors. Shan6, a pediatric hexavalent vaccine from Shantha, entered Phase 2. A vaccine entered Phase 2 against HIV infection for at risk population. SAR439794, a TLR4 agonist immunomodulator, entered Phase 1 for the treatment of peanut allergy. An inactivated Zika vaccine entered Phase 1. Respiratory Syncytial Virus vaccine for infants entered Phase 1. On December 28th, 2016, Hanmi and Sanofi entered into an amendment to their initial license agreement executed for the development of a portfolio of long-acting diabetes treatments. Sanofi returned to Hanmi the rights related to the weekly long-acting insulin to primarily focus on development of the weekly GLP-1 (efpeglenatide). 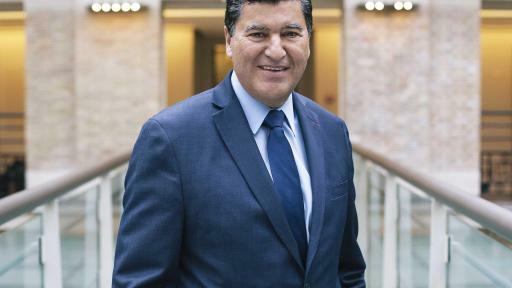 Hanmi will take the development lead on the weekly insulin and will assume responsibility for the development of the long-acting weekly efpeglenatide/insulin drug combination for a certain period of time, after which Sanofi will re-assume responsibility for development. To access the full press release of the 2016 Q2 results, please click here. Sanofi expects 2017 Business EPS to be stable to -3% at CER, barring unforeseen major adverse events, consistent with its previously announced Strategic Roadmap guidance for the 2016-17 period. Applying the average December 2016 exchange rates, the currency impact on 2017 Business EPS is estimated to be +3% to +4%. This press release contains forward-looking statements as defined in the Private Securities Litigation Reform Act of 1995, as amended. Forward-looking statements are statements that are not historical facts. These statements include projections and estimates and their underlying assumptions, statements regarding plans, objectives, intentions and expectations with respect to future financial results, events, operations, services, product development and potential, and statements regarding future performance. Forward-looking statements are generally identified by the words “expects”, “anticipates”, “believes”, “intends”, “estimates”, “plans” and similar expressions. 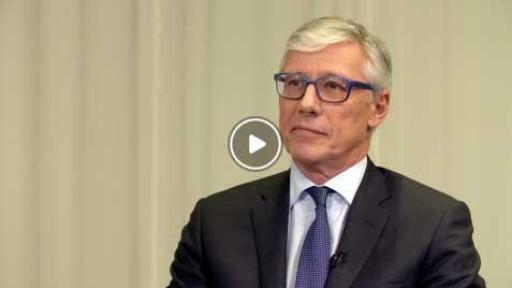 Although Sanofi’s management believes that the expectations reflected in such forward-looking statements are reasonable, investors are cautioned that forward-looking information and statements are subject to various risks and uncertainties, many of which are difficult to predict and generally beyond the control of Sanofi, that could cause actual results and developments to differ materially from those expressed in, or implied or projected by, the forward-looking information and statements. These risks and uncertainties include among other things, the uncertainties inherent in research and development, future clinical data and analysis, including post marketing, decisions by regulatory authorities, such as the FDA or the EMA, regarding whether and when to approve any drug, device or biological application that may be filed for any such product candidates as well as their decisions regarding labelling and other matters that could affect the availability or commercial potential of such product candidates, the absence of guarantee that the product candidates if approved will be commercially successful, the future approval and commercial success of therapeutic alternatives, Sanofi’s ability to benefit from external growth opportunities and/or obtain regulatory clearances, risks associated with intellectual property and any related pending or future litigation and the ultimate outcome of such litigation, trends in exchange rates and prevailing interest rates, volatile economic conditions, the impact of cost containment initiatives and subsequent changes thereto, the average number of shares outstanding as well as those discussed or identified in the public filings with the SEC and the AMF made by Sanofi, including those listed under “Risk Factors” and “Cautionary Statement Regarding Forward-Looking Statements” in Sanofi’s annual report on Form 20-F for the year ended December 31, 2015. Other than as required by applicable law, Sanofi does not undertake any obligation to update or revise any forward-looking information or statements.